There was a party atmosphere at the Transat facilities at Montréal–Trudeau airport on Monday as Canada's largest integrated tourism company celebrated its 30th anniversary in fine style by unveiling its new fleet livery. "I feel a great sense of pride when I look at how far we've come since November 14, 1987, when our first flight took off from Montreal bound for Acapulco," said Jean-Marc Eustache, President and Chief Executive Officer of Transat. "And our journey is far from over. While our tour operating business and our aviation operations are tried and tested, our services continue to evolve to meet the expectations of travellers today and in the future. We have plenty of innovations coming up, including the new fleet livery that we are unveiling this evening, and the new hotel division that we are about to create, all in pursuit of our goal of remaining at the forefront of the travel industry." Throughout its 30-year history, Transat has stayed true to the vision of its founders: that of a leisure travel company open to the world. Today, Transat offers customers 60 destinations in two major markets: transatlantic (Europe and the Middle East) and South, out of 21 Canadian airports. It commercializes its flights to Canada in 13 European countries, as well as in Israel, the United States and at its Sun destinations. It boasts 5,000 passionate employees worldwide, who help brighten the every day with the joy of vacations for more 4.5 million passengers every year. And it is working to build a better future for the planet, through engagement with communities and investments in sustainable development. 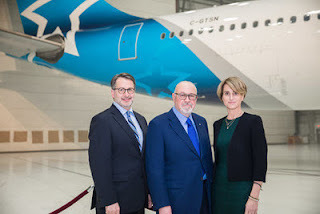 "The story of Transat's growth over the past 30 years is a remarkable one," said Dominique Anglade, Deputy Premier of Quebec, Minister of Economy, Science and Innovation, and Minister Responsible for the Digital Strategy, in her address. 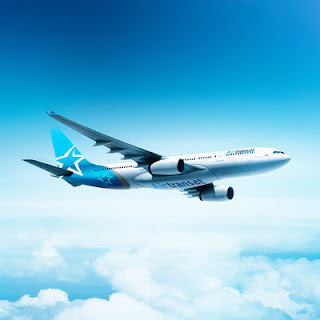 "Today, Transat is Canada's leading integrated tourism company, and Air Transat is the country's number one leisure carrier. Transat also attracts some 500,000 European travellers each year to Quebec and the rest of Canada, notably from France and the United Kingdom, two major tourism markets. Through its operations, this first-class employer generates substantial economic benefits for all of Quebec." Yes, read on for more on the new look and more photos. 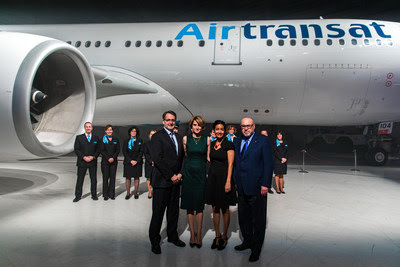 Unveiled during the evening, the new Air Transat fleet livery reflects the recent evolution of the Transat brand image and remains faithful to the company's promise: to brighten every day with the joy of vacations. The star symbol, recognized emblem of Transat, is proudly displayed on the tail and the rear side fuselage and also on the wingtips. To mark the 30th anniversary, the design uses touches of grey, a nod to Air Transat's very first livery. That livery features graduated shades of blue, to evoke the transformative power of holidays. Finally, the Air Transat name appears on the side and underside of the fuselage, ensuring its visibility even when the aircraft is in flight. "I love the new look, it is sleek and classy whilst also being bold. The way it echoes the past whilst attaining a modern style is visually appealing" Jason Shaw, author and aviation commentator.